Did you know that when you use #wintervillage on Twitter or Instagram, your shared post could end up on our website or the screens at The Rink Pavilion? Our new Wayin technology pulls Tweets and 'grams that use #wintervillage and collects them for display. Now you can share your great photos, and see others' posts! 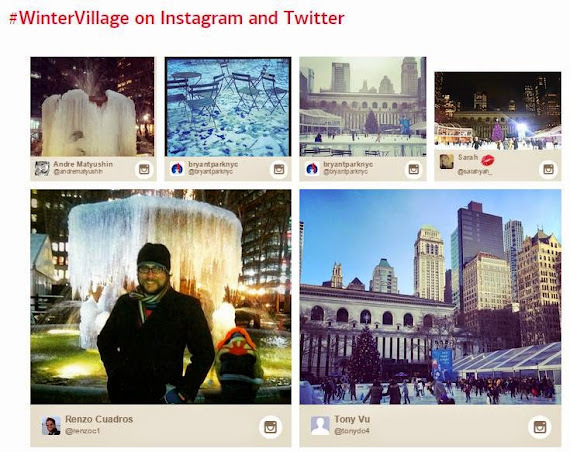 This screenshot from wintervillage.org shows Instagrams that use the #wintervillage hashtag. The tiles flip and change, creating a dynamic collage. So don't forget the hashtag #wintervillage when you're posting those beautiful winter park photos. It's just another way that visitors can interact with and be a part of the Bryant Park experience. This screen in the Pavilion streams #wintervillage content from Twitter and Instagram, and displays it on the left hand side of the screen. You can see your content streamed live!